Info "Find the hidden secret in the video! Pause it where you find the secret." Instant Replay is one of WarioWatch's microgames in WarioWare: Twisted! The purpose of the game is to tilt the Game Boy Advance slowly to freeze the video on the appropriate frame. The player starts off the game with 15 seconds. 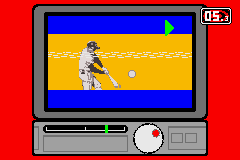 1st level difficulty: The player must slow the video until the batter hits or get hit by the baseball. The player can easily tell when they have to stop the video. 2nd level difficulty: The player must slow the video until the lost creature is shown. The player won't be able to tell where to stop right away. 3rd level difficulty: The player must slow the video until one of the five figures is seen taking a doughnut. This can happen at any random moment and there is no hint how close the player is to it. Three of the five figures reappear in Arms Race from WarioWare: Touched! This page was last edited on November 16, 2018, at 21:57.